Dr.Torres has practiced Optometry for over 20 years. She grew up locally in the city of Glendora and is a graduate of Glendora High school. She earned a bachelor of arts in biology at the University of San Diego. From there she went on to earn her doctorate from the Southern California College Of Optometry in Fullerton. Dr. Torres has worked for several large medical groups including CIGNA, Friendly Hills and Magan. She is great with patients of all ages. She is fluent in Spanish. Currently, she is listed in the index of Americas' Best Optometrists 2002,through 2005. In addition to her busy schedule, Dr. Torres is an active member of the Upland and Claremont Chamber of Commerce. She also recently became a member of the Claremont Rotary. Dr Torres is on the board of director's for the Claremont Chamber of Commerce. She also is serving as the President for the Inland Empire Optometric Society. Personnel: JOHN, CARRI, AND TANIA. 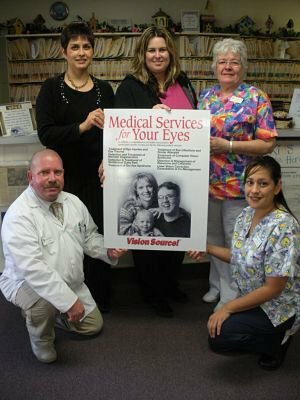 OUR STAFF HAS MANY YEARS OF EXPERIENCE IN THE OPTICAL FIELD AND THEY ARE VERY KNOWLEDGEABLE. PLEASE SEE DETAILS BELOW.